So I told you this shirt was my yee haa Western shirt but it was too cold to show off its cowgirl features last time! Here it is in all its glory on Aboriginal Workshop Day – it’s my students’ last week in Australia so we have lots of lovely workshops and most require special clothes so I will enjoy sharing my purposeful and often super comfy outfits this week! Oh by the way, I meant to say how lucky it was a grabbed the pants on the top of the pants shelf yesterday because I noticed these cords from Sportsgirl which I bought in about 2002. They went to Hong Kong and back with me and have kept me warm through many a winter’s day over the past decade but I haven’t worn them all year! What a lucky find! They fit into so many categories – old faves, magic pants, warm and comfy. I think there is just enough winter left for everyone to get sick of them now I have found them again. 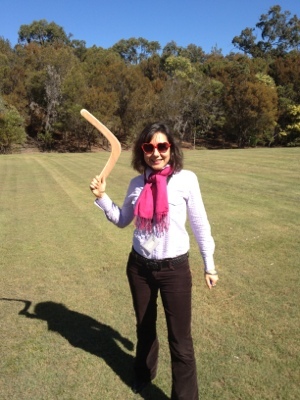 Posted in Brisbane Fun, fashion, Sportsgirl, work and tagged Aboriginal Australia, boomerang, winter. Bookmark the permalink.